The Portland ForestDragons are a Champions Internet Fantasy League football team which was formed in February 2016. 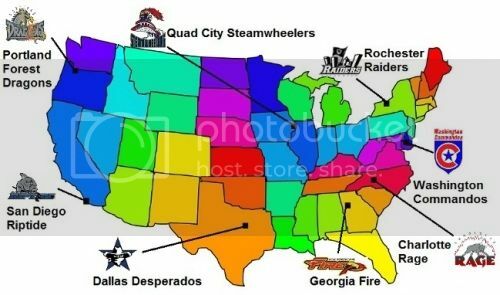 They play in the IFL Division of the CIFL, which was formed in January 2016. The team is named after the former Arena Football League's Portland ForestDragons, which played 1997-99. The current ForestDragons are based out of a Portland, Oregon Suburb, with a satellite office in Boise, Idaho from where the team will be operated for the majority of the season. 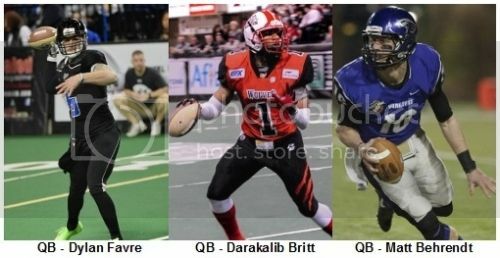 The CIFL plays its games using a combination of players from the Indoor Football League and Champions of Indoor Football. The CIFL begins the 2016 season in the fifth week of the aforementioned leagues' games Eight teams make up the league, forming two divisions, the IFL and CIF. The draft was held over a seven day span between March 10 through March 16. Through a randomized draft order, The ForestDragons selected first in the odd numbered rounds and last in the even numbered rounds. This meant they were afforded the first selection in the draft. With that pick, they selected wide receiver Demarius Washington of the Indoor Football League's Colorado Crush. Another notable selection came in the second round with the 16th overall pick, where they selected quarterback Dylan Favre of Champions of Indoor Football's Cedar Rapids Titans. Favre is the nephew of former NFL Super Bowl winner Brett Favre. The ForestDragons are innovative when it comes to technology and have created the league's first media guide blog and thread (this page). The team is run by using a notebook computer, tablet and cellular phone. This enables its owner flexibility in coordinating activities involving both the team and the league; 24 hours a day, seven days a week. 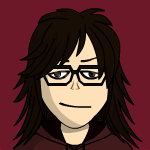 The ForestDragons are owned by Angela Martin, a native of the Portland area. The only female owner in the league, she is a three-year letter in high school softball and has studied tae kwon do for 12 years. She is currently a freshman in college studying communications. On March 17, Martin announced that her youngest sister, Monika, would serve as a consultant for the team. "We are excited to be involved in such a progressive football league as the CIFL. What fans can expect is start-to-end action from this group and we are thrilled with the players we have acquired. We expect them to have tremendous chemistry and a uniquely high motivation to win. If I were an opponent, I would not want to see this team on the other side of the field." Rd. 1, Pick 1 -- WR Demarius Washington: "We looked at several players here, but Demarius' playmaking ability was too valuable to pass up. He is the type of player around which you can definitely build a franchise. We could not be more thrilled to welcome Demarius to Portland. Rd. 2, Pick 16 -- QB Dylan Favre: "Dylan is a strong passer with an exceptional pocket presence. We are thrilled to be able to build our team around a player with his skill set. Obviously, he comes to us from a solid quarterbacking family, so we know the game of football is in his genes." Rd. 3, Pick 17 -- RB Calvin Phillips: "Calvin gives us a big, explosive runner with the ability to break a big run and withstand the punishment defenders in this league can bring. We are thrilled to bring him in as not only a complimentary piece, but as a featured attraction of what is turning out to be an extremely high-powered offense; an offense which is more than capable of leading our team to the CIFL championship." Rd. 4, Pick 32 -- WR Ronald Davis: "Ronald is a solid receiver who will be an outstanding compliment to our first overall pick, Demarius Washington. He is always capable of a breakout game and we are looking for some great things from him. We are happy to have him come to the Rose City." Rd. 5, pick 33 -- QB Darakatalib Britt: "We are ecstatic that Dak was available. We love what he can bring to the team. We feel we have an exciting player who could start for most teams. We are confident that he can back up Dylan and come in during bye weeks and be successful. We are thrilled that Dak will be in a ForestDragons' uniform this season." Rd. 6, Pick 48 -- WR Tommy Curry: "We're looking forward to having Tommy in Portland. He's the kind of receiver who is always poised to make a great play. We are looking for great things from him this season." Rd. 7, Pick 49 -- RB Quenin Benning: "We are absolutely elated that Quentin was still available at this point in the draft. He is going to give us some quality and depth at the running back position. Quentin and Calvin Phillips will make for an exceptional one-two punch." Rd. 8, Pick 64 -- WR Attrial Snipes: "Attrial is an explosive player who we expect big things from in 2016," ForestDragons owner Angi Martin said. "We look to him to be an intragal part of our offense from day one. We are very excited about this pick." Rd. 9, Pick 65 -- QB Matt Behrendt: "Quarterback is the most important position on the field and perhaps in all of sports. This selection brings a very talented passer to Portland. Depth is a priority for this franchise and we like what Matt can bring to this team." Rd. 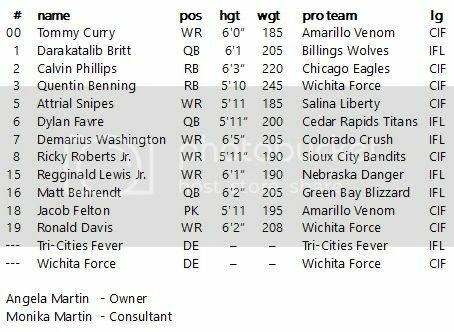 10, Pick 80 -- DE Wichita Force: "Our defensive coaches are very excited to have such an opportunistic group of players on the roster. This unit collectively has the talent to stifle opposing offenses, as well as to create turnovers and get the ball back to our offense. We feel this is a tremendous pick and look forward to having these players in the Rose City." Rd. 11, Pick 81 -- WR Regginald Lewis, Jr.: "Regginald gives us a receiver capable of exploding any given week. He is a wild card and we look forward to seeing him on the field." Rd. 12, Pick 96 -- PK Jacob Felton: "We are excited to have a kicker of Felton's range and accuracy. We expect him to solidify our kicking game significantly." Rd. 13, Pick 97 -- DE Tri-Cities Fever: "This squad has shown flashes of brilliance this season. It is a young group, but we feel the guys have a lot of potential and a high learning curve." Rd. 14, Pick 112 -- WR Ricky Roberts, Jr.: "This pick is commonly referred to as 'Mr. Irrelevant,' but there is nothing irrelevant about the potential we see in Ricky. He is the type of player who will improve week in and week out. We feel that Ricky is a very exciting prospect." 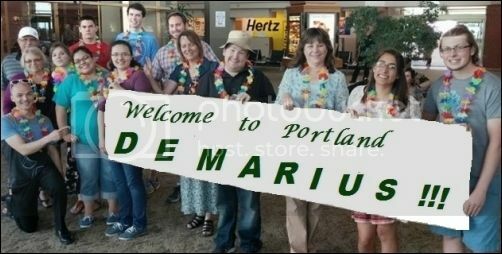 ForestDragons fans at the airport welcome first overall pick Demarius Washington to Portland. Very much appreciated. Thank you! this is hilarious, but it looks great. i particularly love the photo of the fans at the airport! March 21, 2016 -- The Portland ForestDragons have announced they have acquired the Omaha Beef defense. "We are excited to bring this group in and give them a legitimate shot and earning a roster spot; their first test will come this weekend," the team said in an official press release. To clear a roster spot, the team has waived WR Attrial Snipes. "I would like to thank Attrial for his hard work during our one-day training camp, and wish him all the best in his future endeavors," the team said. The ForestDragons face the San Diego Riptide in week 6 (March 25-27) of the CIFL season. This is great! Good luck with your season! PORTLAND -- The ForestDragons have announced they have signed free agent wide receiver Daniel McKinney of the Dodge City Law (CIF). McKinney has scored 35 points on the season, highlighted by a season-high 20 in last week in his team's 49-48 loss to the Amarillo Venom in week five. "We feel Daniel is a talented player who is ready to step into a leading role in the receiving corps," the ForestDragons said in an official statement released from the team's head office in a Portland suburb where the team's owner is enjoying a week of spring break. "We are going to sort of throw him into the fire in week 6 and see how he responds. We are looking for great things from Daniel." 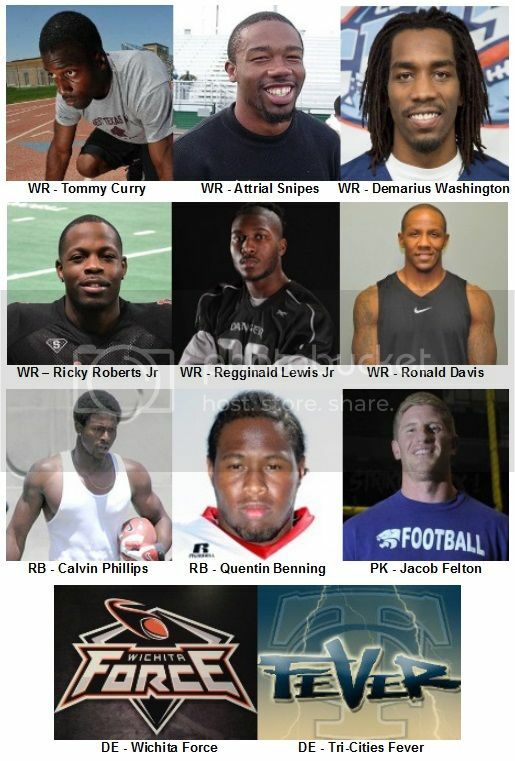 The team also announced it has released wide receiver Tommy Curry of the Amarillo Venom (CIF). Curry went scoreless in the ForestDragons' season opening win, an 83-69 win over the Georgia Fire in week one. "Tommy is a remarkable player and great teammate," the owner said. "It is unfortunate that we barely got to know him. We wish him the best as he continues his career. May 3, 2016 - According to sources, a kicker controversy is brewing in Portland between incumbent Jacob Felton and newcomer Zeke Arevalo. "Our team has a kicker?" one unnamed ForestDragons player remarked. "Wait, we have two of them? Wow, where have I been?" The ForestDragons have refused to comment on these reports. May 16, 2016 -- The Portland ForestDragons are preparing for a playoff run with a pair of roster moves this week. The team announced today that it has signed WR Stacey Howard of the Chicago Eagles (CIF). This comes on the heels of the addition of the Duke City Defense (CIF) earlier in the week. "We are very happy with our core group," the team's owner said from the team's satellite office in Boise. "We are excited to add such an exceptional talent as Stacey, even if that is generally considered a girl's name. "The addition of the Duke City Defense loads us at depth on that side of the ball." To clear the roster spots, the team announced it has released WR Zach McClain of the Salina Liberty (CIF) and the Tri-Cities Fever defense (IFL). "Zach did a nice job for us in the few weeks he was a ForestDragon," the team said in an official press release. "It was tough to say goodbye to the Fever Defense, as they were with us from day one. "I personally wish the Fever and Zach the best in their future endeavors." The ForestDragons are locked in a three-way battle for two playoff spots they enter week 13 of the season. They face three straight division foes to close out the regular season. First up is this week's match up against the Georgia Fire, whom Portland defeated in week five, 83-69. May 11, 2016 - A playoff berth and possible IFL Division title are within the sights of the Portland ForestDragons with just two games remaining in the CIFL regular season. Portland faces division rivals San Diego this week and Rochester in the regular season finale. The team's are locked into a three-way battle for the division's two playoff spots. "This is why we play the games," the team said.in a statement. "We are fortunate to be in a position where we control our playoff fortunes." There are several scenarios in which the ForestDragons could earn a trip to the postseason. * A Portland win or a Rochester loss in week 13 clinches a spot for the ForestDragons. * A Portland win over Rochester in week 14 and the ForestDragons are in. * A Portland win over San Diego in week 13 and a San Diego loss to Georgia in week 14 to nches a playoff spot for the ForestDragons. * Wins in the final two Portland games clinches the division. Other scenarios involving tiebreakers also could come into play, but those are unclear with two games remaining. Martin said the team may not be able to win a potential tiebreaker over either Rochester or San Diego upon the close of the regular season. In other news, the team announced it has suspended operations at its satellite office in Boise. The team will be run completely out of Portland throughout the duration of this season. How did your season go?